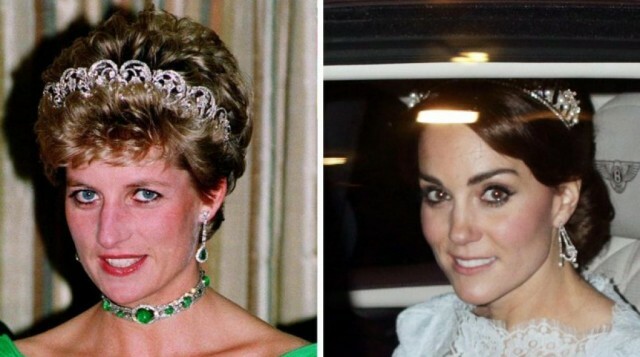 The elegant Kate is increasingly similar in terms of taste the famous Lady D. The future queen of England has recently worn the tiara favorite of Diana. The tiara most beloved Princess Diana back to sparkle in the halls of Buckingham Palace, this time to wear it is the future Queen of England Kate Middleton, who has raised for a reception hosted by the Queen in honor of the diplomatic corps. To give first the news, complete with a picture the Daily Mirror. The newspaper published especially the shot that took a very elegant Duchess of Cambridge as she descended from the Bentley, on arrival at the palace, with her ​​husband William. The crown, known as the Cambridge Lover’s Knot Tiara, is a jewel of pearls and diamonds priceless. She was worn by William’s mother, Lady D., remembered as the princess of the people in several important circumstances. The history of the tiara is aging more than a century, was commissioned in 1914 for the famous Queen Mary, consort of George V, who wanted a jewel similar to that of his grandmother, Princess Augusta of Hesse. Then it was inherited by the current sovereign, the Queen Elizabeth, and finally donated by the latter to Diana as a wedding gift for the marriage with Prince Charles in 1981. For the first time Kate has had the great honor to wear it. The famous tiara is invaluable not only economic but also emotional: wear it would be the dream of every girl. Princess Diana loved her very much and we see worn in many of the most famous photos. She could not however take too long: so big and heavy, made ​​her migraines. The tiara is in fact composed of 19 arches pearl pendant with diamonds. Kate Middleton has been immortalized with a series of photographs that depict elegant, wearing a white dress decorated with lace. The tiara on the head of the mother-in-law, accompanied by pendants of brilliant. A dream comes true for Kate.